This barn/apartment design takes advantage of a natural synthesis of combining 1880's Second Empire architectual styling with 21st century, contemporary floor plans for both the barn level and the apartment above. Today we see many barns and barn apartments with gambrel roofs. The advantage of this roof style is its capacity to maximize interior space above the eve line. But the predecessor to the gambrel roof was the Mansard roof, a dominate feature of the Second Empire style. The usable living space in the apartment is nearly double the size possible with a standard gable roof. The barn level consists of six 12'x12' stalls, a tack room, grain room, utility/laundry room, half bath, interior stairs to the second level, wash stall and a 14' wide center aisle. The apartment above includes two bedrooms, two bedroom walk-in closets, two full baths, an office room, upstairs laundry room, kitchen, dining room and living room in an open floor plan arrangement, and the tower room. Other features include a gas log fireplace, master bath whirlpool, built in bookcases, large central skylights and a spiral stair case to the tower room. 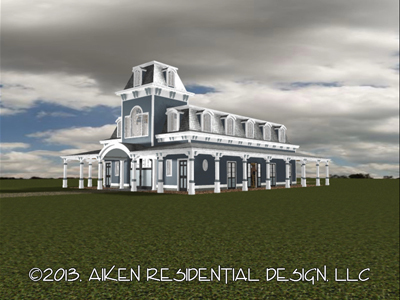 And while this barn is not for everyone, or everyones' budget, it represents the kind of signature barn possiblities available to clients of Aiken Residential Design.